If someone would have told me that Arabian horses could help people, I might have thought they were crazy. I mean, how can the labeled “hot headed” Arabian help people, right? Wrong! They totally can — and do. I have discovered Arabians bond with their owners on a deeper level than any other breeds I have encountered. I can say that because a little Arabian mare did just that for our 11-year-old daughter. We adopted our daughter at a young age from a neglect/abuse social services situation. We maintained contact with two of her siblings (and still do), and even took in her younger brother who was born later on. However, due to a social services mistake, her younger brother returned back to the care of the department. Then, a week later, my mother died of breast cancer, and three months later my father died. My daughter was caught in a storm of grief and loss, so much so that she was not able to fully comprehend it. How can you explain loss of this level to a child? Although Jenna, whom we affectionately call “JJ”, knows she does not live with her other siblings, we do manage to maintain contact with two of her six siblings. She has never voiced the word adoption, but she knows that her situation is not normal. We have been blessed to maintain contact with her older brother and sister with the family that adopted them. However, even this contact did not help JJ when she became withdrawn, scared, unsure, and very reserved. Prior to the losses, JJ was a vivacious little girl, but soon retreated into herself. We discovered that JJ loved horses and pursued lessons for her. She worked very hard and displayed that she would do the work to care for the horse in addition to riding them. That is when we decided to purchase her a horse. We had some we looked at, but none really fit JJ. Then, I heard the words “purebred Arabian mare.” To be honest, from a past experience with an Arabian who was very hot, I was reluctant to even entertain this horse as an equine choice. However, the person selling her, Liz Lawrence, assured me that the mare was sweet, although she had been overlooked due to her petite size. We decided to see her — and it was a match! The petite little chestnut mare, Atalaaya, out of Mostly Padron, was also looking for her “forever person.” Although she had proved successful in showing, people wanted bigger Arabians. The purchase of Atalaaya began the journey of a lifetime for my daughter and for us, too. JJ has worked extensively with Atalaaya for almost two years now, showing “Atty” in halter, dressage and hunter in open, rated and regional shows. JJ absolutely loves showing and has become an ambassador for Arabians, sharing her love for them with others. During the past two years, Atalaaya found her special bond, With God’s help, Atty helped heal the part of JJ that we could not reach, restoring her confidence, bravery, strength, and belief in herself. JJ is no longer afraid or withdrawn, but has come into her own a brave equestrian. Who would have thought a little petite Arab would do that? This article is my way of paying it forward. not only for the breed, but so that people can see just how awesome this experience has been for us — sharing how much horsemanship is needed today, especially for our youth in this age of technology. In addition, the Arabian breed needs more people who share their knowledge time and support for the youth. After all, who else will continue the legacy and promotion of the Arabians but our youth? We have been blessed to find such a person with Liz Lawrence at Legacy Farms who has patiently shared her knowledge of Arabians and supported JJ with her showing. JJ has dreams to ride in the Olympics one day, and although that may be a long shot, we smile for the blessing of JJ dreaming again, thanks to Atalaaya. 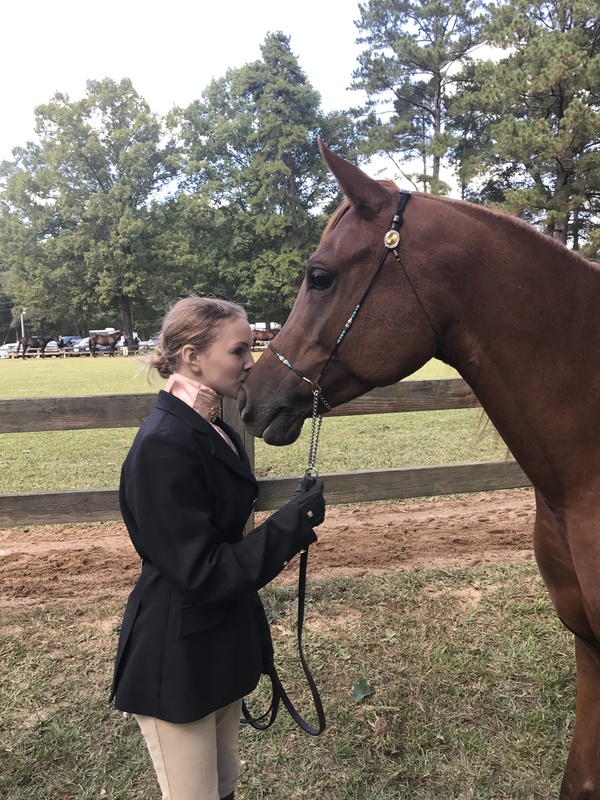 EDITOR’S NOTE: Angie Campbell is from North Carolina, where on Jan. 27, her daughter JJ and Atty received year-end awards by the North Carolina Arabian Horse Association. In just her second year of experiencing horses, she is qualified for Youth Nationals.